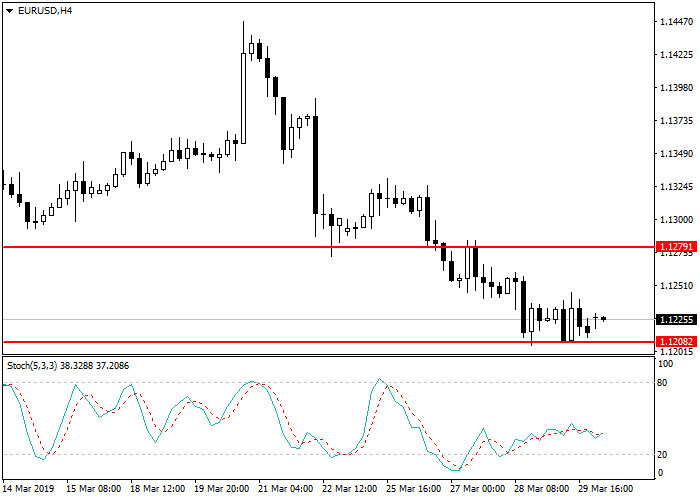 EUR is trading within a downward trend. The nearest important resistance is at the level of 1.1208. In case of its breakdown, the next target will be the renewal of the previous minimum at the level of 1.1180. EUR, like GBP, is under pressure due to unclear conditions regarding Brexit. Last Friday, the British Parliament rejected the agreement and plan for leaving the EU, developed by Teresa May, once again. If the UK does not provide Brussels with an approved project, then on April 12, it will leave EU without a deal, which will have a negative impact on the exchange rates of both countries’ currencies. In order to find a way out of the crisis situation, EU officials are planning to hold an early summit on April 10 but, as most political observers believe, the likelihood of exit without a deal is extremely high. Today, in Germany and France PMI and March EU CPI will be released. However, most traders who are concerned about the impending recession in the United States are waiting for the publication of a report on the labor market on Friday. It is predicted that the number of new places will increase by 175K. Stochastic is at 37 points and does not give signals to open trading positions. Short positions can be opened after the breakdown of the level of 1.1180 with the target at 1.1142 and stop loss 1.1200.